The “envelope” is the continuous air barrier that is formed by the shell of your house: the external walls, the doors and windows, the slab or cellar ceiling, and the roof. Green builders in cold or moderate climates consider the building envelope the first and most important “passive” strategy of an energy-conserving house. The tighter the envelope (the less air leaks) the more control you have over the atmosphere of the house and the less you are forced to use active systems to heat or cool the house. The graph below shows how much homes can differ from one another in terms of tightness. Almost everyone agrees a tighter home is better from the standpoint of comfort and energy efficiency, but exactly how tight a home needs to be is more controversial. 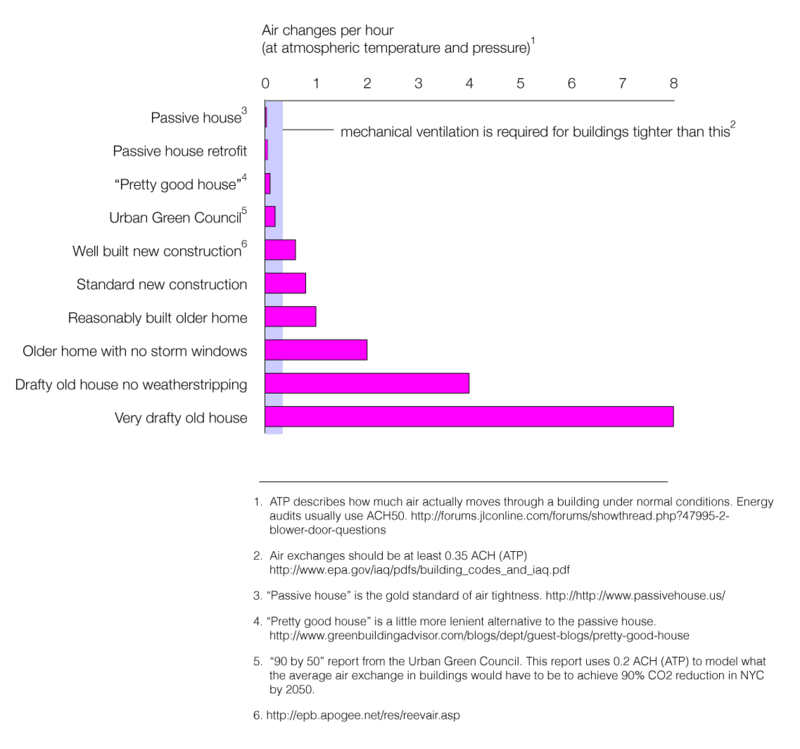 Making a house super tight, especially a retrofit, takes a lot of money and resources. After you have filled up all the easy air leaks, it gets harder and harder to find the really small leaks. So there are diminishing returns on your efforts. Some engineers say that it’s better to make just a fairly decently tight house and spend the saved money on an “active” systems like solar panels on the roof – which at certain point might more than make up for the lost energy through air leakage. To complicate matters more, when the envelope reaches a certain level of tightness, you need to supply some sort of mechanical ventilation to provide airflow. In a leaky old house mechanical ventilation is not needed because the tremendous amount of airflow through cracks and porous walls. The great thing about a mechanical ventilation system is that they can include a heat recovery system. This is a mechanism that absorbs heat or coolness from the air before expelling it and then applies it to the incoming air. They can be a very efficient way of allowing your house to “breath” without paying the price of lost energy. Mechanical ventilation is, however, an “active” system, and it consumes some energy just to operate – so this needs to be brought into the equation as well. For more on this read Martin Holladay’s analysis and critique. 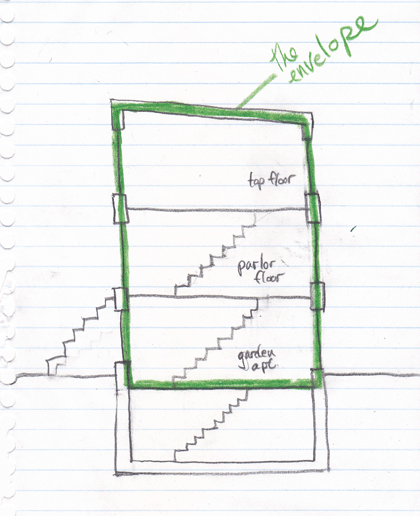 Our house has a fairly simple envelope. It is a cuboid shape without any jutting appendages or cutouts – which would make the envelope less efficient and harder to seal. 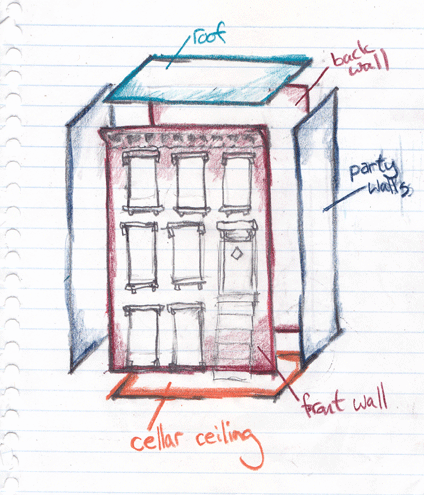 Two walls are party walls – that’s the massive advantage of the townhouse. These walls still need to be part of the envelope, but on our very modest budget we will opt to do the minimum amount of work on them. They are covered in plaster and plaster, if it has an un-cracked surface, is an air barrier. There will need to be a lot of detail work of sealing and caulking along these walls but no demolition or construction. As you can see the from the diagram, the cellar ceiling will form the lower barrier of the envelop and we will exclude the cellar itself. The roof forms the upper boundary of the envelope. If we opt for a new roof it will make this part of the job easier. The front and back walls form the really hard part of the equation. Partly because they could end up being the most expensive area to seal and partly because there are some nice architectural details on the internal walls that we want to keep. In future posts you will hear more about how we will deal with each of these surfaces and the tough trade-offs that we will have to make. This entry was posted in envelope. Bookmark the permalink.